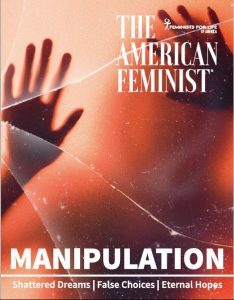 ALEXANDRIA, VA—“MANIPULATION: Shattered Dreams, False Choices, Eternal Hopes” may be our most powerful issue of The American Feminist ever. In it, Feminists for Life reveals and analyzes the internal and interactive training documents and multimedia elements developed by Planned Parenthood Federation of America and the Consortium of Abortion Providers as they attempt to normalize abortion and win over counselors who have qualms about abortions. An attorney by training, journalist Ellen J. Reich provides an in-depth interview of 10 former clinic workers from “And Then There Were None,” an organization founded by Abby Johnson that serves those who have escaped the abortion industry. “What made them work there? What did they see and do? What made them leave? Their insights will stun even those in the pro-life movement for decades,” Foster said. In addition, this gripping issue also features an in-depth article about the lives of girls and women in the “adult” entertainment industry by FFL speaker Joyce McCauley-Benner, reported during her efforts to rescue these teens and women from the street. FFL Board member Sharon Serratore shares the chilling experiences of girls and women coerced into abortion, while law school student Jessica Stanton analyzes new laws to protect them. Finally, New York Times staff editor Anastasia Economides tells the terrifying experience of a woman held hostage abroad. “I warn you that the contents of ‘MANIPULATION’ may shock you, and this is inappropriate for young and sensitive readers. But without our knowing what is happening behind the scenes, we will never improve the lives of the most vulnerable.” Foster concluded. Editor’s Note: This issue of The American Feminist is a limited release. To guarantee a copy of this powerful issue, sign up or re-up your membership today, if you haven’t already. This is also included in gift memberships. Inquiries about booking Ms. Foster or Ms. McCauley-Benner to speak should be emailed to info@feministsforlife.org.